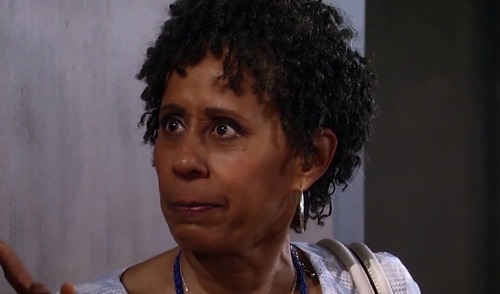 General Hospital (GH) spoilers reveal there could be a lot more to “Aunt” Stella Henry’s (Vernee Watson) obsessive behavior when it comes to Curtis Ashford (Donnell Turner). Of course, we completely understand her dislike for PCPD Police Commissioner Jordan Ashford (Vinessa Antoine) for cheating on Tommy and lying about TJ’s (Tequan Richmond) paternity for years – but General Hospital spoilers hint that there is something more going on here. Stella belittles Jordan, every chance she gets – rudely rejecting gifts and unappreciative of anything she does, is she just bitter or is she seeing something in Jordan she doesn’t like in herself? Remember how Stella had a stroke in the summer and revealed to Curtis how she had to sacrifice everything to return to Baltimore to raise him and his brother? She also mentioned that she didn’t get married to a man named Marcus because of him – immediately rephrasing that to deflect his questioning. TPTB at GH , don’t usually drop a name without reason. General Hospital spoilers suggest they could have been referring to Marcus Taggert (Real Andrews). It is possible that Stella is not a virtuous as she seems to be, and very plausible that Curtis is her son and not her nephew. Stella could have had him with Marcus when they were both teenagers, and she gave him up to her sister to raise. This would definitely explain why she is so invested in Curtis life and why she doesn’t want to see him end up with Jordan after what she did to Thomas/Tommy. Imagine the irony of the situation! Not just how Jordan would react after everything Stella has been preaching but also how Curtis has repeatedly done work for Sonny Corinthos (Maurice Benard), the very man Marcus Taggert came to Port Charles to destroy. General Hospital fans know that Marcus was mentored by Sonny’s step father Deke Woods and became a police officer because of him. Once in Port Charles Marcus only hated Sonny more when the woman he had a soft spot for, Lily Rivera (Lilly Melgar), was also killed by a bomb meant for her husband Sonny. Marcus was eventually forced out of town by Scott Baldwin (Kin Shriner) – but can you imagine the havoc it would cause if Marcus does turn out to be Curtis’ father? Do You Believe Stella Is Curtis’ Mom?